Previously, we’ve looked at justifying a CPQ solution through improved performance within the sales unit. Most of these reasons will apply if you are talking about simple CPQ tools, more elaborate CPQ solutions or even enterprise-class CPQ platforms. Better sales, faster sales and error-free selling always translate into better business. But what about the rest of the organisation? Where else can CPQ make a difference? In this blog we will look at how CPQ can bring benefits to other areas—beyond sales―in your enterprise. Organisations are typically unique unto themselves, and it is doubtful that any two organisations are exact replicas of one another. The benefits we discuss here may or may not necessarily apply to your organisation, but some likely will. 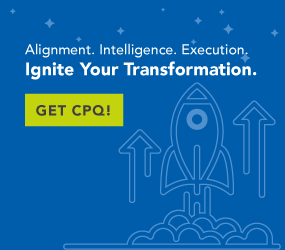 There are four primary areas that can benefit from a well-executed CPQ implementation. Operations, Product Management/Engineering, Finance and Marketing can all realise great benefit through CPQ. Let’s take a look at each area. Manufacturing companies have many challenges and should be constantly looking for areas that are prone to waste. ERP solutions that are oriented to the manufacturing operation will frequently aim at better inventory controls, supply chain management and flattening production peaks and valleys as a source of improved efficiencies. CPQ can make a difference in each of these areas as well. Managing the supply chain is all about making sure that upstream suppliers are able to deliver needed supplies and parts in a most efficient way. The ability to communicate needs quickly and early helps elements within the supply chain fulfill downstream needs through better planning of their own needs. CPQ used in ecommerce or sales-managed inquiries provides data regarding interest and potential need for parts and supplies well in advance of the placement of an actual order. Analytical processes can evaluate this interest-level data and predictively inform operations and supply chain managers of coming needs in the near- and medium-horizon future. This facilitates better management of local inventories as well. It also provides excellent predictive data to production planning and scheduling managers. Resources can be allocated further in advance with fewer last-minute fire drills. Product managers and engineers are always looking at crystal balls to decide where R&D dollars should be spent for product development and improvement. CPQ delivers real data on the frequency of options selection, after-sale option additions and specifics related to what options simply don’t move with this or that type of customer. This data can be useful in determining what options might be dropped or perhaps preserved within a bundle to offset the costs of maintaining availability of the product for lower numbers of customers. Additionally, functional holes in the solution can be identified through inquiries made but not fulfilled. This data is helpful to product managers who are trying to identify potential investments aimed at extending or expanding the reach of an otherwise mature offering. Who loves data more than Finance? CPQ can provide a veritable mountain of data related to pricing, revenue and cash flow at high or extremely granular levels. Knowing when revenue comes in, when it falls off or when unexpected fluctuations take place helps Finance better plan the enterprise budget and forecast for the current and pending business cycle. Additionally, metrics can be identified to better understand the financial impact of the operational elements identified above through the use of CPQ. Marketing, like Finance, is more and more dependent upon data to drive decision-makingwithin their operational context. CPQ can help identify new markets through an analysis of similarities with existing markets and also extend existing markets by identifying potential functionality that can be applied to existing solutions that are already in place in the field. Like cross– and upselling within a Sales operation, Marketing can employ the same type of logic to create better and more frequent opportunities in the future. These are just a few examples of how CPQ can benefit the organisation well beyond the sales silo. CPQ drives better and more frequent opportunities, and it helps management understand what is going on within their production process. It also facilitates better reporting and planning by Finance, Marketing and product management.